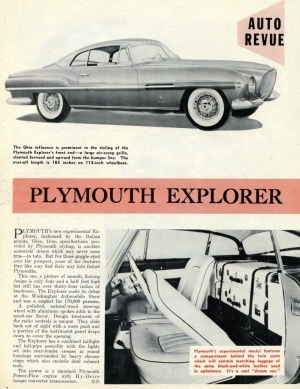 The Plymouth Explorer debuted in the May 1954 Motor Trend Magazine. Despite its racy good looks, the Explorer was a slug with it's 6-cylinder engine coupled to a Hy-Drive transmission. 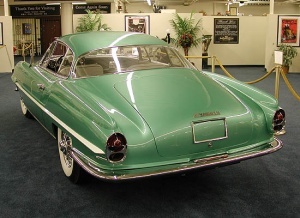 Virgil Exner source the body craftsmanship to Carrozzeria Ghia in Turin, Italy, who built most of the metal bodied Concept Cars for the Chrysler Corporation. 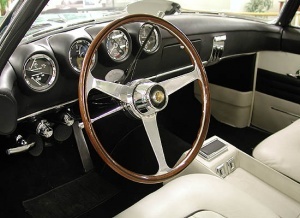 The Plymouth Explorer was one of the many Concept/Dream Cars That Virgil Exner, head of the Advanced Styling Studio created to freshen up the stoggy look and reputation of the Corporation's late 40s and early 50s cars. 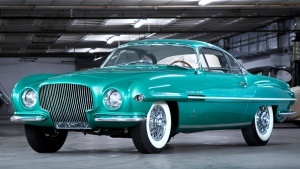 Other concept cars for 1954 included the Plymouth Belmont and the Desoto Adventurer. The Dodge Firearrows, DeSoto Adventurer and Plymouth Explorer significantly helped to rejuvenate the company's image. Chrysler's 'Forward Look' styling of 1955 - 1961 inspired other automakers to return to their drawing boards to revise their models which lacked Chrysler's fresh, Italian-inspired flair. 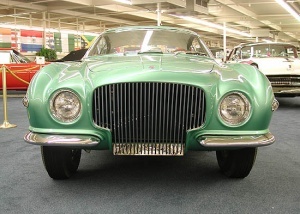 It was designed by Luigi Segre at Carrozzeria Ghia. The chassis was the shared Dodge/Plymouth 114” platform. 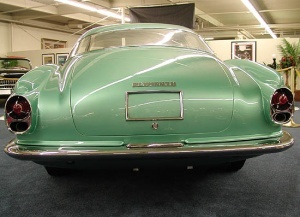 The car was distinguished by its bright Metallic Green paint with elegant ivory colored side reveals, vestigial fins, twin exhausts that exited through the rear fenders, and Kelsey Hayes wire wheels. The Explorer was 76.9 inches wide, 54.4 inches tall, and 185.2 inches long. White leather interior with bucket seats and fitted luggage. 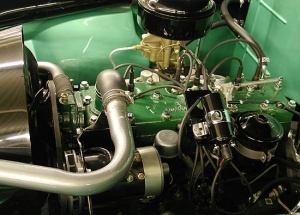 The engine is a Plymouth 230-cubic-inch l-head six boasting a humble 110 horsepower, and the transmission the 3-speed Semi-Automatic Hy-Drive. The car was found by Joe Bortz of Bortz Auto Collection in the late '80s. 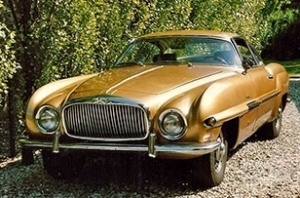 It was located in Sweden painted Gold with a Jaguar engine, Taylor transmission and rear end and not in running condition. Some liberties were taken in the restoration. It has an "Updated Engine", the bumper was changed to a pair of small bumperettes, and the grill has a funky Jaguar look to it. Even the wiper orientation was dramatically change from original. The car was offered for sale in the March 1990 issue of Hemmings Motor News with an asking price of $95,000. It currently resides at the Petersen Automotive Museum. This page was last modified on 24 September 2017, at 23:49.